Annie made this great chopped salad based on the "Chopped Mexican Salad with Roasted Peppers, Corn, Tomatoes & Avocado" recipe from Fine Cooking Magazine July 2006, p 57. First, she roasted some seeded red bell peppers and corn in the oven with olive oil until the peppers were soft, then diced the peppers. She also diced up some tomatoes and avocado. She blanched some broccoli and chopped that up as well (the original recipe calls for diced jicama). All the ingredients were mixed together along with a drained can of black beans and garnished with chopped cilantro. The dressing was a honey-lime-cumin vinaigrette which included garlic, lime juice, orange juice, shallots, honey, toasted ground cumin, olive oil and fresh ground black pepper. 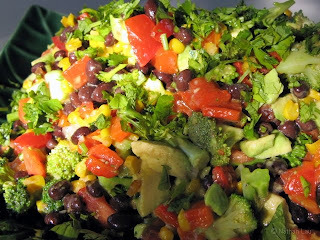 This is a great salad which has a lot of flavor and texture.